Have you tired searching best free Christmas border for your invitation card, Santa letter, flyers, and other decorative items which you are planning on this Christmas? Well, we hope your search would definitely end after reading this article. 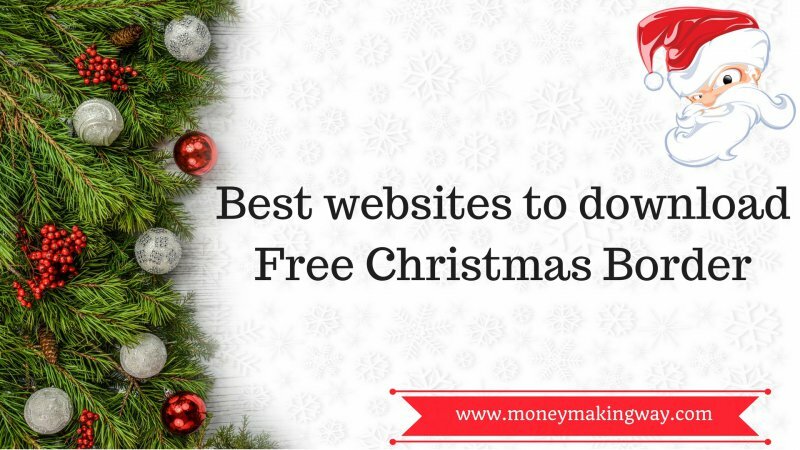 Because for our readers we have compiled the best list of free Christmas border which will fulfill your all need. Borders not only add beauty to the decorative items but also spread the positive vibes of the festive season. But searching the best borders over the internet can be a mess. As most of the sites either do not have good quality or designs. But here we will share the sites which provide high-quality images with best designs. Following are the best websites for Free Christmas borders. Vecteezy will provide you thousands of free Christmas border and backgrounds. Which includes bells, trees, reindeer carriage, ribbons, balloons, flowers and much more. The site provides many other free and premium items like christmas clip art, Pumpkin clip art and holidays vector graphic images. No registration is required in order to download the image. Browse your desired image through the category and download with a click of a button. Another great website if you are looking free Christmas border. Here you won’t find in thousand, as they only have 30 images but all are beautiful to explore and can be part of your decoration project. The site also allows you to edit and add the clip art before printing. This helps you to make your letter more appealing. You can take the print out directly or you can save the file in PDF, png, and JPG format. You can also make certificates such as birthday, school, graduation, milestones, and sports awards. Pageborder is not limited to Christmas border only you can find tons of page border related to food, animal, nature, school, sports, summer, holidays, winter, pattern, and kids. In Christmas category, they have around 24 borders with high quality and better designs. But you have to compromise with their watermarks which you will find at the bottom of the page. If you don’t want watermarks then you need to select their premium version. However, we have found there is no problem for choosing watermark border. Hellasmultimedia will provide you 89 free Christmas border which you can download directly without registration. you will find varieties of the border including the sidebar, animated, frame with red ribbon, snowy tree, navy, blue border with angels and many more. Hellas multimedia not only provides free Christmas border but much other stuff which you need for festival and holidays, such as Thanksgiving day, valentines day, wedding, baby, birthday, Easter, Halloween, new year, and St Patrick’s day. PNGtree provides very high-quality images but the only limitation they have is that you can download only 3 images per day after that it would be chargeable. So first finalize your desired image before downloading. The file is available in PSD and PNG format. Login is mandatory here you can’t download any pic without registration. Pixabay is a website which offer free images and you can find some high quality Christmas border here. And the best part is that you can download image in multiple resolution. No registration required simply select the image and resolution and click on download button. Images are available both png and JPG. Christmas border are really important to decorate your invitation letters and flyers. Its not only makes your letter look beautiful but also ads grace of festive season. Which eventually makes your invitation card more meaningful relevant and appealing to your recipient. All the websites which we have discussed are providing high-quality free Christmas border. Which you can download and use for your decoration purpose.